DAMOURS (d’Amours) DE FRENEUSE, MATHIEU, seigneur in Acadia and member of the Conseil Souverain of New France in succession to his father; baptized 14 March 1657 at Quebec, the son of Mathieu Damours de Chauffours and Marie Marsolet; d. 1696. Mathieu Damours studied for the priesthood and was in orders from 1677 to 1680 at the Quebec seminary but withdrew. Thanks to his father’s influence, he and three of his brothers–Louis*, Sieur de Chauffours; René*, Sieur de Clignancour; Bernard, Sieur de Plaines – received large seigneurial grants in Acadia. That of Mathieu Damours, dated 1684, included the land between Jemseg and “Nacchouac” (Nashwaak) on the River Saint John. Here he developed the best cultivated seigneury on the river and with the help of his brother Louis built a lumber mill. He brought in settlers, erected a residence and barns, built up a herd of livestock and was soon raising crops. In addition, he appears to have engaged in trade with the Indians. In 1689 he was appointed to the Conseil Souverain but only in the absence or on the death of his father; he appeared before that body for the oath-taking ceremony in 1690. He and his brothers were disliked by Governor Joseph Robinau de Villebon who complained to the home authorities that they were licentious and disobedient, making little effort to improve their properties – charges which were unreasonable in the case of Mathieu Damours. 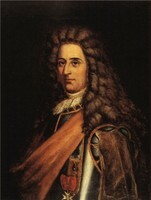 In 1696, a New England expedition under Col. John Hathorne attacked Fort Saint-Joseph (Nashwaak), headquarters of Governor Villebon. Mathieu Damours figured prominently in its successful defence. When Hathorne and his men withdrew, they burned Damours’s home and killed his cattle. Damours himself fell ill from exposure suffered during the attack and died soon afterwards. His widow – Louise Guyon*, the widow of Charles Thibault – whom he had married in 1686, moved to Port-Royal (Annapolis Royal, N.S.) when the governor, Monbeton* de Brouillan, established his headquarters there. There seems little doubt that during the years she was at Port-Royal she was on intimate terms both with the governor and with the Sieur Denys* de Bonaventure, a prominent naval captain. This caused her to be one of the most talked about persons in New France. In 1708 she was sent to Quebec and there received in high social circles. Three years later she reappeared at Port-Royal, now in English control, having crossed the Bay of Fundy in a birch-bark canoe in mid-winter with only an Indian and her youngest son to help. She was given permission to settle there. Soon afterwards a force of English soldiers was ambushed and that same evening Mme Damours was taken to safety by a French force, adding weight to the suspicion that she had only returned to Port-Royal to serve the French cause. AN, Col., B, 16, 17, 19 (see PAC Report, 1899, Supp., 296, 307, 309 f., 314). Jug. et délib., III, IV. Lettres de noblesse (P.-G. Roy). P.-G. Roy, Inv. concessions, IV, 2; Inv. contrats de mariage, II, 119. W. O. Raymond, The River St. John, its physical features, legends and history from 1604 to 1784, ed. J. C. Webster (Sackville, 1943). P.-G. Roy, “Mathieu Damours de Chauffours,” BRH, XXXII (1926), 385–94; “Mathieu Damours de Freneuse,” ibid., 577–82. Webster, Acadia, 16, 17, 86–87, 170–74. George MacBeath, “DAMOURS DE FRENEUSE, MATHIEU,” in Dictionary of Canadian Biography, vol. 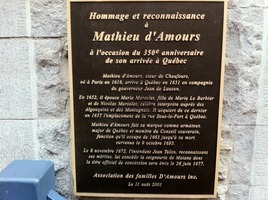 1, University of Toronto/Université Laval, 2003–, accessed April 24, 2019, http://www.biographi.ca/en/bio/damours_de_freneuse_mathieu_1E.html.